(Nanowerk News) A health care robot that displays a patient’s temperature and pulse, and even reacts to a patient’s mood. An autonomous vehicle with an information display interface that can be changed based on the passenger’s needs. Even in this age of smartphones and other electronics wonders, these ideas sound quite futuristic. But a team of Cornell graduate students – led by Rob Shepherd, assistant professor of mechanical and aerospace engineering – has developed an electroluminescent “skin” that stretches to more than six times its original size while still emitting light (Science, "Highly Stretchable Electroluminescent Skin for Optical Signaling and Tactile Sensing"). The discovery could lead to significant advances in health care, transportation, electronic communication and other areas. 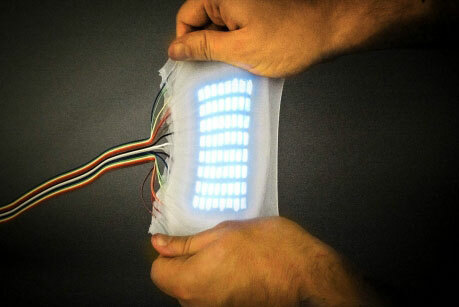 The research group of Rob Shepherd, assistant professor of mechanical and aerospace engineering, has developed a highly stretchable electroluminescent skin capable of stretching to nearly six times its original size while still emitting light. This hyper-elastic light-emitting capacitor (HLEC), which can endure more than twice the strain of previously tested stretchable displays, consists of layers of transparent hydrogel electrodes sandwiching a dielectric (insulating) elastomer sheet. The elastomer changes luminance and capacitance (the ability to store an electrical charge) when stretched, rolled and otherwise deformed. In addition to its ability to emit light under a strain of greater than 480 percent its original size, the group’s HLEC was shown to be capable of being integrated into a soft robotic system. Three six-layer HLEC panels were bound together to form a crawling soft robot, with the top four layers making up the light-up skin and the bottom two the pneumatic actuators. The chambers were alternately inflated and deflated, with the resulting curvature creating an undulating, “walking” motion. Shepherd credited a group of four graduate students – Bryan Peele, Chris Larson, Shuo Li and Sanlin Robinson – with coming up with the idea for the material. All but Li were in Shepherd’s Rheology and Processing of Soft Materials class in spring 2014, when the seeds for this discovery were planted. In addition to the four graduate students, all members of the Shepherd Group, contributors included Massimo Tottaro, Lucia Beccai and Barbara Mazzolai of the Italian Institute of Technology’s Center for Micro-BioRobotics, a world leader in robotics study. Shepherd met Beccai and Mazzolai at a conference two years ago; this was their first research collaboration. Although Shepherd admitted to “not being very fashion-forward,” another application involves wearable electronics. While wearable technology today involves putting hard electronics onto a soft base (think Apple Watch or Fitbit), this discovery paves the way for devices that fully conform to the wearer’s shape. The Shepherd Group has also developed a lightweight, stretchable material with the consistency of memory foam, with the potential for use in prosthetic body parts, artificial organs and soft robotics.